Gummy bears are not only a delicious treat, they also have multiple uses in science. This term my year 9 class are completing a project called Project Mars. Project Mars is a joint project with the Powerhouse Museum where students can remotely control a Mars Rover to perform experiments on a recreated Martian surface to find out whether Mars could support life. To collect and analyse the data from these experiments on the Martian surface, students need to learn about atoms and waves, and this is where gummy bears come in. Gummy bears have come in really handy for two experiments showing the properties of light. Gummy bears can be used to show how light is absorbed, transmitted and reflected. This activity show why objects have different colours. Students shined a red laser light onto red gummy bears and green gummy bears. The red light will transmit and reflect on the red gummy bears, but absorbed by the green gummy bears. Students then shined a green laser light onto red gummy bears and green gummy bears and compare the observations. This experiment makes the concept of absorption, transmission and reflection of light more real to students. I came across this experiment on YouTube. Gummy bears, skewers and duct tape is used to make a wave machine to demonstrate a range of properties of waves. 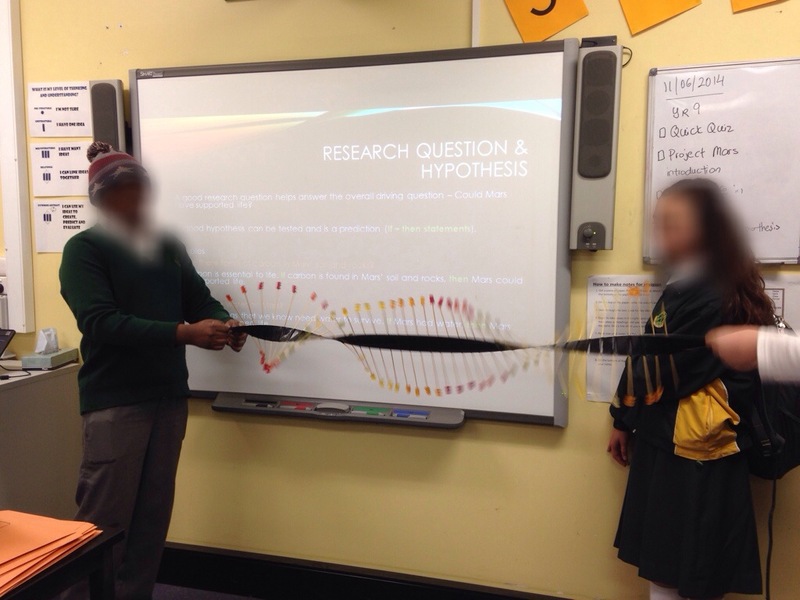 I really like this experiment as it is a hands-on and visual way to show students properties of waves and works a lot better than skipping ropes and slinkys. 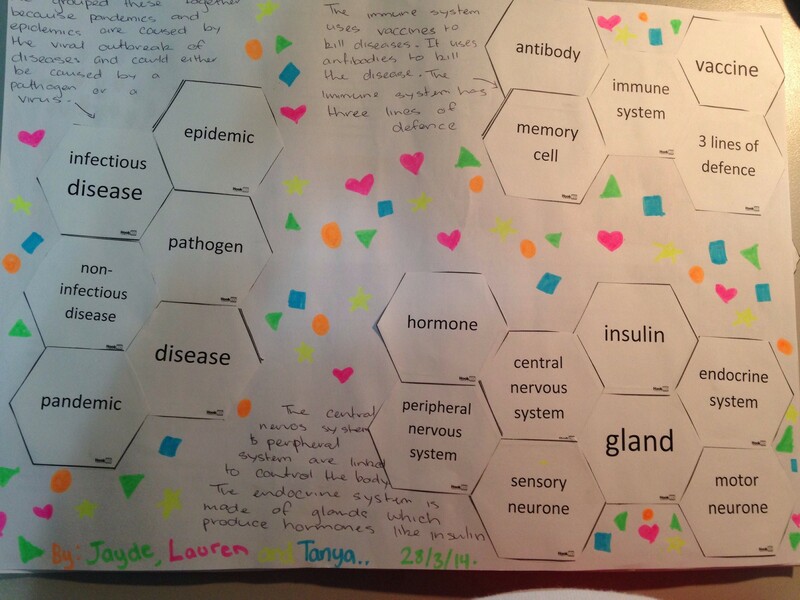 This is probably not new but this term I’m trialling a different way of doing homework with Year 9s. I try to make homework so it doesn’t become a workload burden for myself and my students. A lot of my students have extra-curricular activities like sport and I have had quite a few parent phone calls raising the concern between balancing their family lives and homework. I’ve also had the issue of different access to resources from home. A lot of my students love doing homework activities online, but not all of my students have internet access. To create a set of online homework activities and then another set of offline activities, for all four of my classes became too labour-intensive that there was very low return-of-investment. So this term I’m doing something different with Year 9s. They will be given a choice in what kinds of homework they want to. The topic is on the nervous system, endocrine system and immune system. I’ve made sure there are activities that are quite basic (like completing a table) to activities that are higher-order that require the creation of products like video. I’ve also made sure that students can choose HOW they complete their homework. They can do things electronically or on paper. Not sure how this will go, but is worth trying. I’d love your thoughts on this, whether you’re a student, parent, teacher or anyone else. Today was the first day where all students were back at school. I had my first lesson with most of my classes today. I never launch into content in the first day. I like to get to know my students first. This year however I want to go further than that and kick off the year by allowing my students to get to know each other as learners. Many of my students know each other socially, but not how they like to learn. While I don’t have any hard data, I’ve always had the inkling that high student achievement not only depends on individual students, but how the whole class works as a group. My higher-performing classes are where individual students apply themselves more but they also get along with each other and help each other. These classes have a sense of community. Each student has a sense of belonging. They work as a team. I want this for all my classes by design, not by random luck. Students paired up and interviewed each other on 3 of their favourite things about science, 2 things they find hard about science and 1 thing they want the teacher to know to help them learn the best that they can. For larger classes, I asked some students to share their responses and then collected their interview sheets to look at later. For smaller classes, all students shared their responses and they were tallied so that students can see what they have in common with other students in terms of learning. 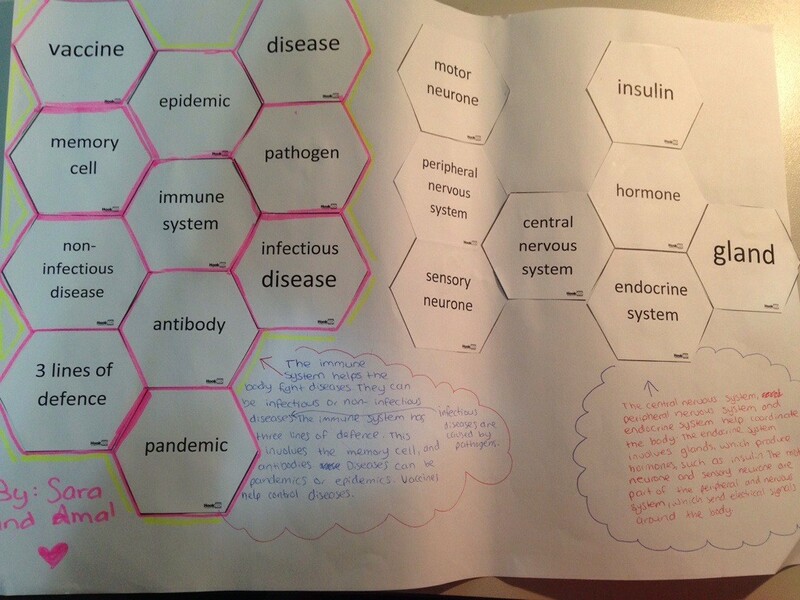 Here’s an example from my Year 11 Senior Science class. 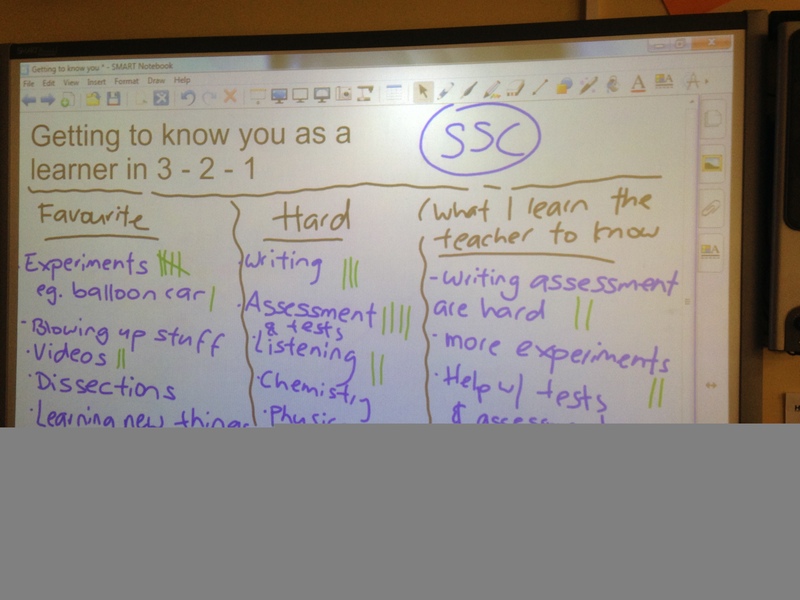 This activity is used to establish classroom expectations where all students get a say. 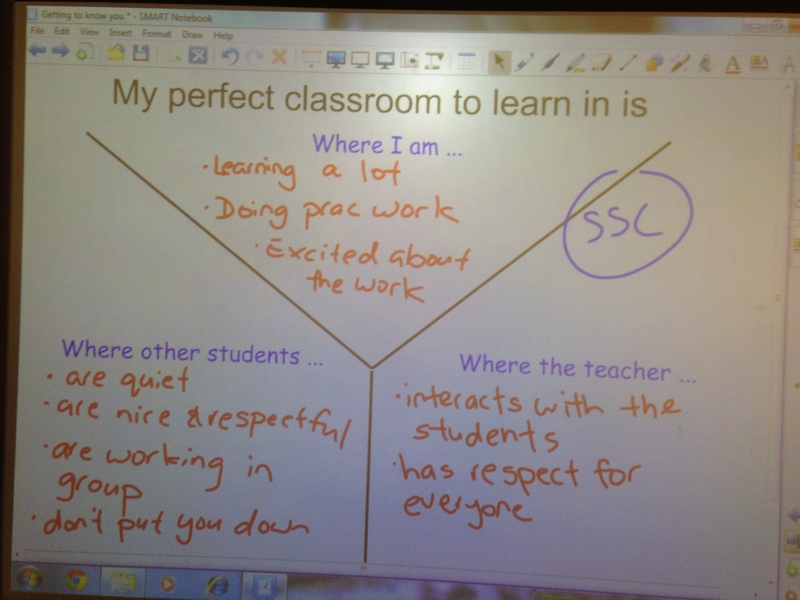 In pairs students brainstorm what their perfect classroom is like. In their perfect classroom what are they doing as students? What are other students doing? What is the teacher doing? All responses are collated on the board and classroom expectations are established. I know some teachers will think this is a ‘soft’ approach and that I should lay down the law instead and let students know who is boss. But I much prefer this way. I really want to focus on developing positive learning relationships amongst students as I strongly believe this will lead to better learning and achievement. In New South Wales, Australia, the 2014 school year is just about to start so I thought I’d share with you my 4 professional goals for 2014. 2013 was the year where I started the journey of connecting my students with current, practising Australian scientists. This was a response to our students’ survey responses that they did not know many careers or jobs that science can lead them to. They also did not know what scientists actually do. Many students have accountants, tradespeople, bankers, etc within their families or family friends but students often do not have exposure to scientists in their everyday lives (ask a student to name a scientist and they’ll still tell you Isaac Newton or Albert Einstein; they rarely name a living scientist). We wanted to make science real in the sense that we can put real people’s faces to what the students learn in the classroom. So in 2013 our school connected with Scientists and Mathematicians in Schools, where we are now partnered with scientist Melina Georgousakis. Melina has already spoken to our Year 8s and 9s on her journey to becoming a scientist, what she does in her job and explained how the immune system and vaccinations work (that’s her area of expertise). 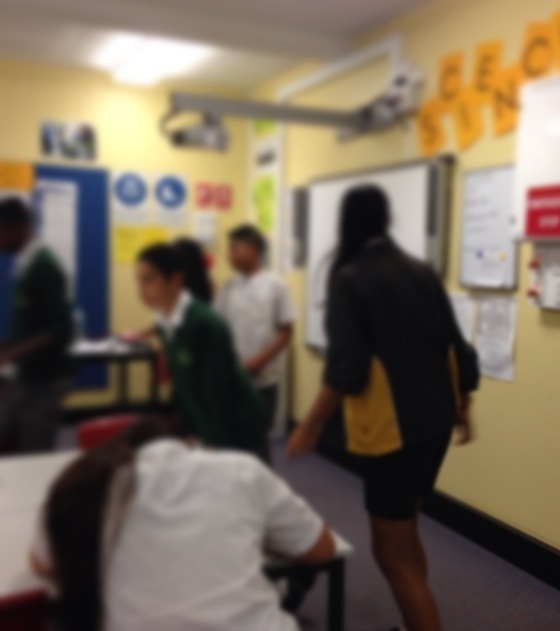 In our end-of-topic survey, a lot of our year 9s listed Melina’s visit as the best activity of the topic. In their words the best part of the topic was “when the lady came in to talk about vaccines”. 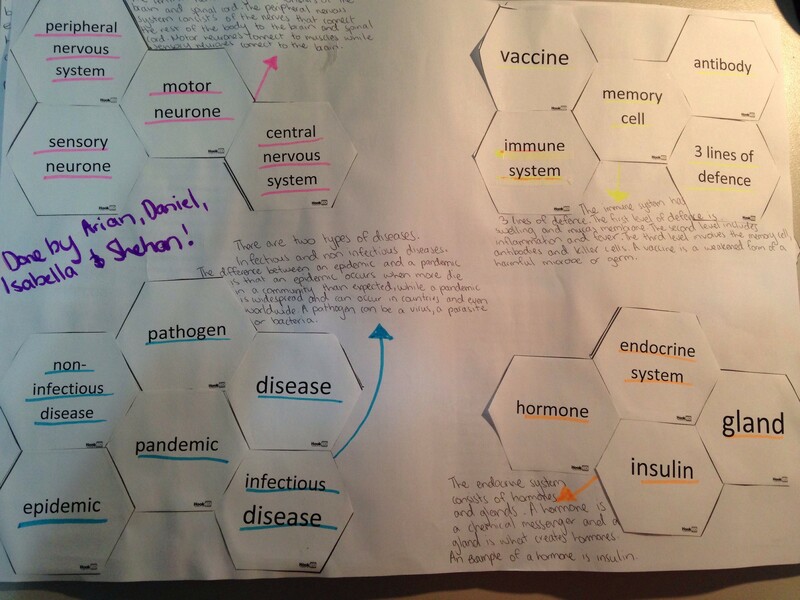 In 2014 we have plans for our Year 12 Biology students to work with Melina when they explore the immune system more deeply. 2014 will also be the year where I want to utilise social media and technology to connect students with scientists, not just in Australia but from around the world. In 2013 social media led me to connect with a postgraduate student called Ash from the University of Technology, Sydney, where he came to the school and spoke to Year 8s about his work with sharks (Year 8s were learning about the role of sharks in the ecosystem and how removing sharks as apex predators impact on the ecosystem). We also connected with Dr Mel Thompson from Deakin University and Dr Karl via Skype. 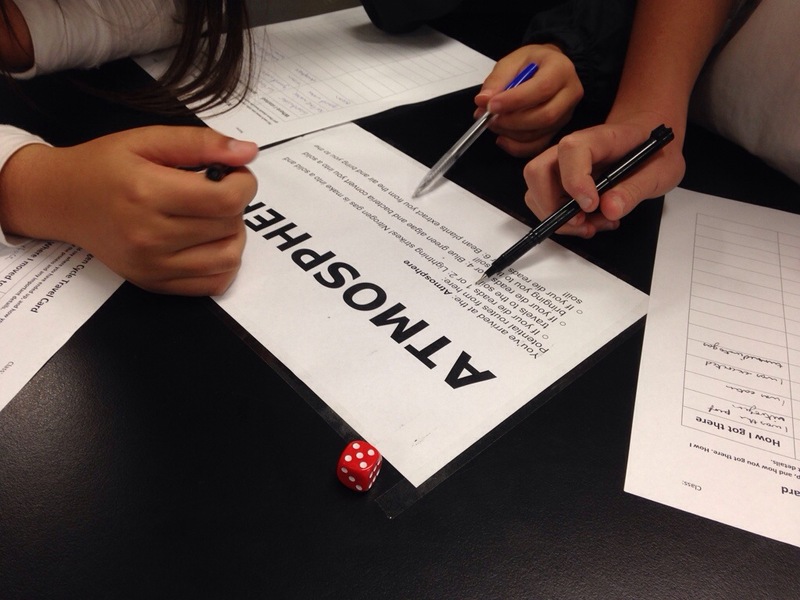 In 2014 I am hoping to expand to using Twitter to connect with my students with scientists. I want to create a class Twitter account for my students and connect with scientists on Twitter. There’s so many of them such as @realscientists and Dr Cameron Webb. I was very privileged to be involved in the UTS Summer School this year where I worked with Christy, a former Questacon presenter (a science communicator who does science shows for children). She re-emphasised to me the importance of designing learning that drives students’ curiosity and create learning experiences that are memorable. One of my biggest gripes with science education is that it uses flash-bang experiments inappropriately. You hear lots of students say they just want to do pracs. You hear a lot of teachers say that all students want to do are pracs. A lot of the times I think showy experiments are wasted at school as they only serve as entertainment. Christy re-emphasised to me that showy experiments need to be set up in a way that drives students to want to know the science WHY something has happened and the journey to understanding they experience must be memorable. This can mean turning explanations into stories, plays, musical items. One of the ideas I have this year is to have a science communication project where students work in small groups and become science communicators themselves where they design and perform an act that explains a scientific concept. If I could I’d like to make this a cross-curricular project with Drama. This year is where our faculty applies the Structured Observed Learning Framework (SOLO) for all students in Year 9. We have used this year’s implementation of the new syllabus for the Australian Curriculum as a drive for this change. See this previous post for more details. 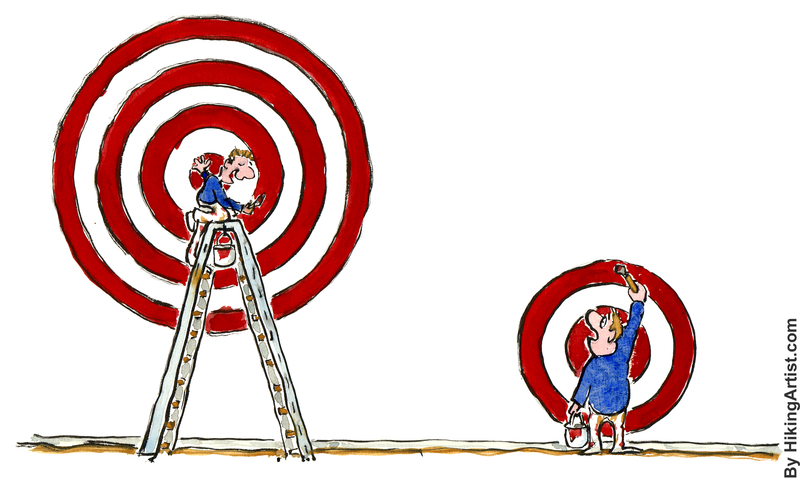 The challenge (not so much a goal) will be to evaluate the impact on student learning. Schools are such busy places that many teachers schedule meetings right on bell times so that we are rushing from one place to another. This year I want meetings where people are now running from their classrooms, crashing down and then expected to immediately adjust their mindframes. I’m hoping that simple things like having meetings start 5-10 minutes after the bell will avoid that rush feeling that make people stress. Eating recess and lunch is my other goal for wellbeing this year. While this seems self-explanatory, I know many teachers don’t eat, or sit down, or even visit the bathroom during school hours because there’s just so much to do. I’m not sure how successful I’ll be at this but this year I want to reduce the number of times where I eat my sandwich while driving home.